Paul-Henri Thillardon in the vines he rents from Château Les Boccards. 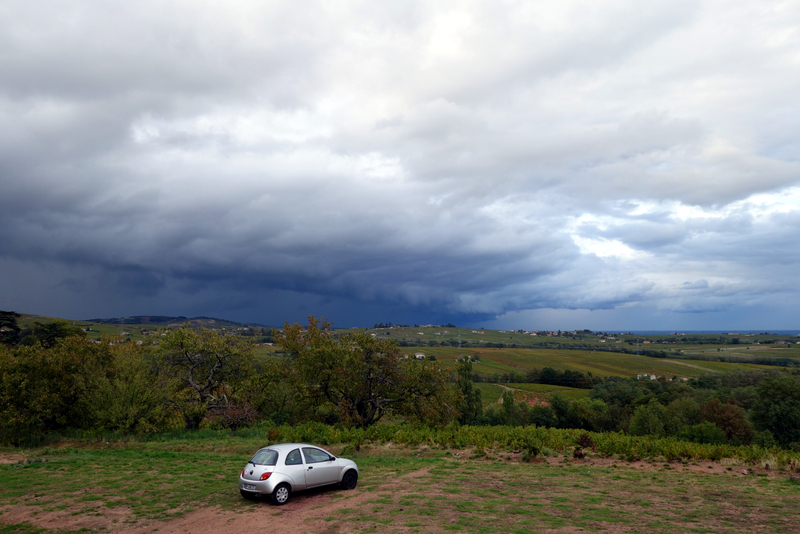 Contemporary Beaujolais is rife with opportunity - overlooked terroirs, abandoned vines, appellations ripe for rehabilitation. But few young vignerons have committed to such ambitious challenges as Paul-Henri and Charles Thillardon, who have positioned themselves as the future of Beaujolais' smallest, sleepiest cru, Chénas. After graduating with a BTS viti-oeno from the Lycée Bel-Air, Paul-Henri says his initial, outmoded goal was to make all ten crus. Much has changed since he founded the domaine in 2008. "We even used select yeast, our first year," he says. 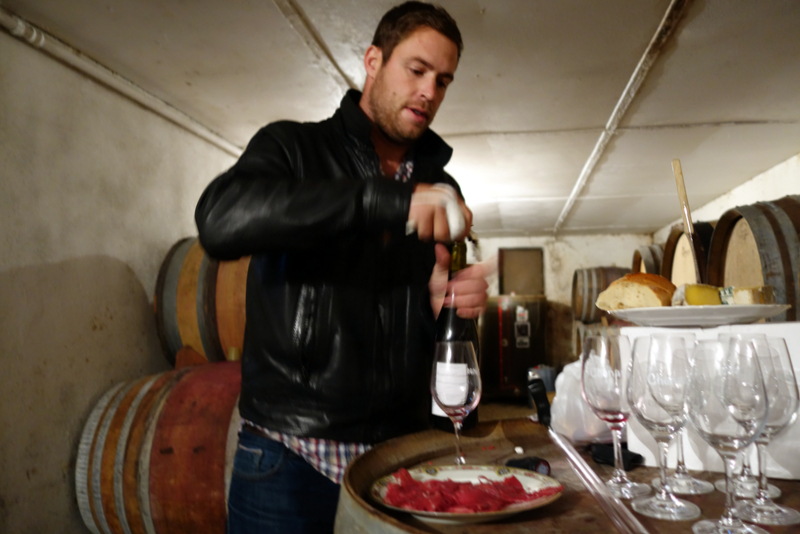 "Because I didn't know how to make natural wine, I'd never seen it in my life, and I'd never drunk it." Then in 2009 he met Fleurie winemaker Jean-Louis Dutraive, a lynchpin of the Fleurie natural winemaking scene who himself had just attained organic certification for his own domaine. "He was the most open," says Paul-Henri, citing Dutraive as introducing him to the aesthetics of natural Beaujolais. "From there I met Julie Balagny, and everyone else." 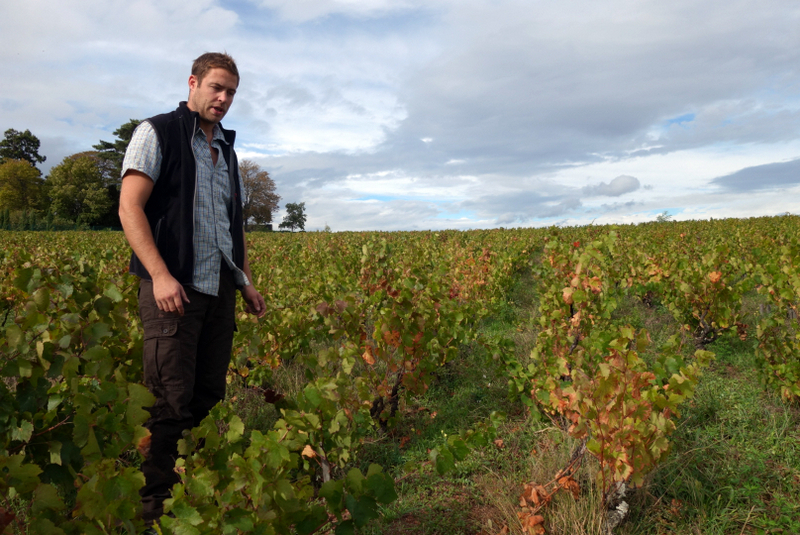 Gradually, as his domaine has grown to its present 12ha, Paul-Henri's winemaking has aligned with those of his mentors. 2015 is the first year he's aimed for long, cool semi-carbonic macerations, refrigerating the harvest for the first time, and vinifying entirely whole-cluster. Paul-Henri Thillardon helping out at Jean-Louis Dutraive's annual "La Part des Grives" late-harvest party. Until 2015, Paul-Henri partially de-stemmed most cuvées and practiced more pigeage and pumping-over, as is normative in the more northerly crus of Beaujolais, whose personalities as a whole seem more influenced by Burgundian methods (and investment...). Now when he speaks of his first all-semi-carbo vintage, it's with a perceptible sense of liberation: "I’m really happy with 2015 because for the first time we’ve really done everything the way we wanted to do it." 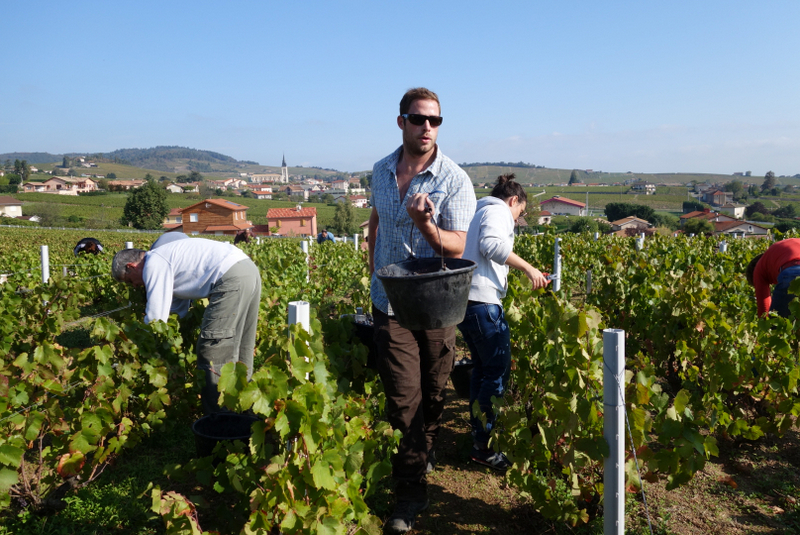 So far 2015 is shaping up a success - the brothers' benefitted from their many obliquely-exposed parcels, and most of their wines have emerged without the excessive alcohol levels often found elsewhere in 2015 Beaujolais. 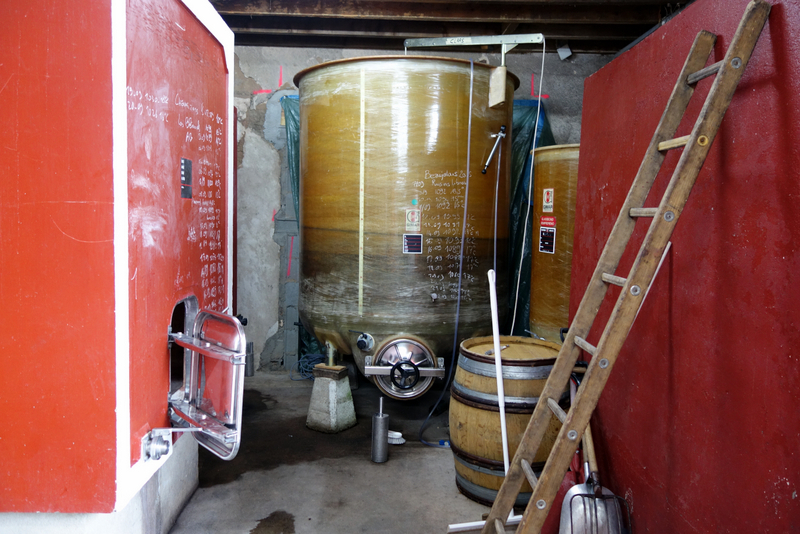 A tank destined for the cuvée "Vibrations" (on which more later) was already showing a sublime rosiness and grace when tasted in late November. 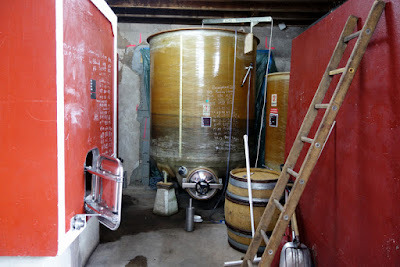 Paul-Henri and his wife live in a very well-converted pigsty on the northern limit of the village proper, beside their biodynamically farmed parcel in the lieu-dit of "Chassignols." The Thillardon brothers hail from Frontenas, in the south of Beaujolais, where their father still grows vines. Paul-Henri founded the domaine in 2008, with his brother Charles, who formerly raised cows, joining him officially just last year. 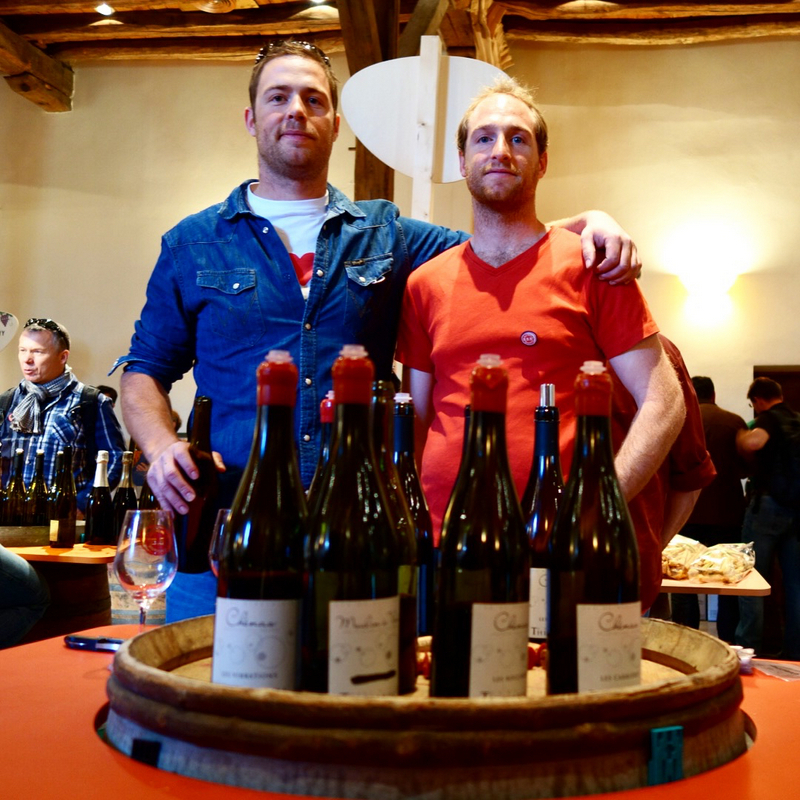 Paul-Henri and Charles Thillardon at the Bien Boire en Beaujolais tasting in April 2015. 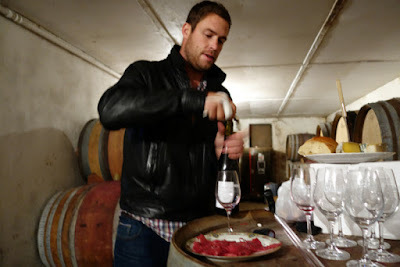 Like most other young winemakers not born into cru vineyards, Paul-Henri assembled the domaine little by little as a patchwork of fermage (rental), métayage (rental paid in wine), and outright ownership. With the exception of the aforementioned "Chassignols" parcel, all is farmed organically, although the brothers intend to move everything towards biodynamics over time. 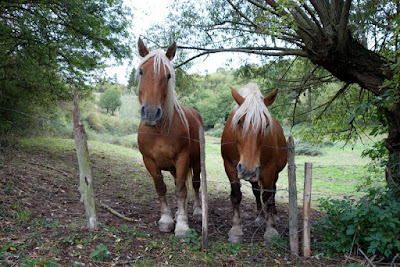 The "Chassignols" parcel they plow with two horses they keep in a friend's pasture nearby. -Almost 2ha of Chénas in the lieu-dit "Les Carrières"
-5ha in the Chénas lieu-dit of "Chassignols"
-A smattering of Moulin-à-Vent, not all of which is in production, in the lieux-dits of "Les Michelons," "Pinchon," and "Deschanes"
-Slightly under a hectare of Chiroubles in the lieu-dit "Le Bourg"
To most readership the figures will be incredibly tedious - but I cite them to demonstrate the logistical challenge of commercialising a fledgling, piecemeal domaine such as the Thillardons' in a way that is comprehensible to consumers. 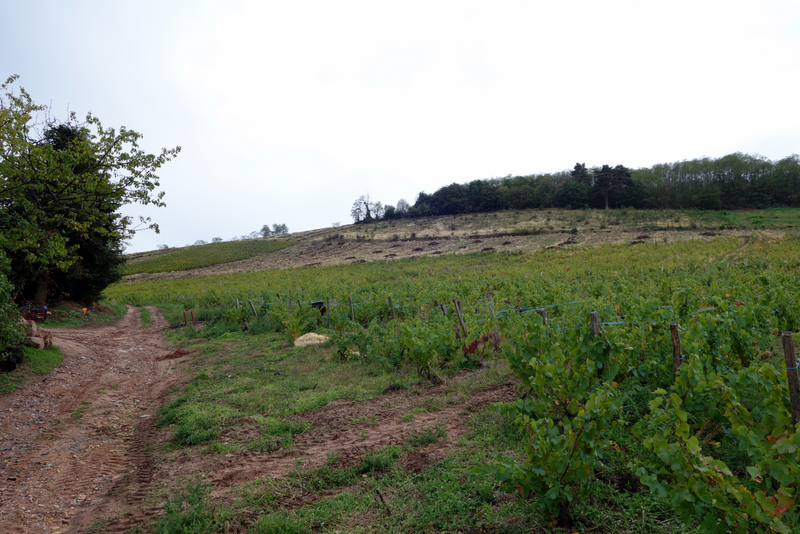 South-facing vines in "Les Carrières," on alluvial stone soil with rounded pebbles. In 2013 and 2014, only the unfortunately-named assemblage semi-carbonic cuvée "Vibrations" saw zero added sulfur. The 2013 shows a lithe energy and a ripe raspberry filip not present in the other cuvées, although the Moulin-à-Vent from 2014, also vinified semi-carbonic without de-stemming, was also impressively well-realised, with wholesome notes of clove-smoke and blackcurrant. 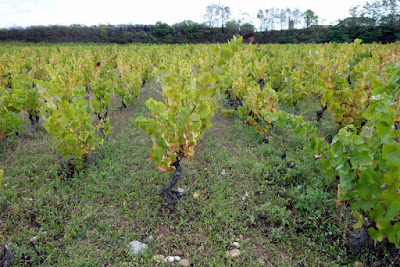 The Moulin-à-Vent appellation needs more wines as bright and glowy as the Thillardon's. 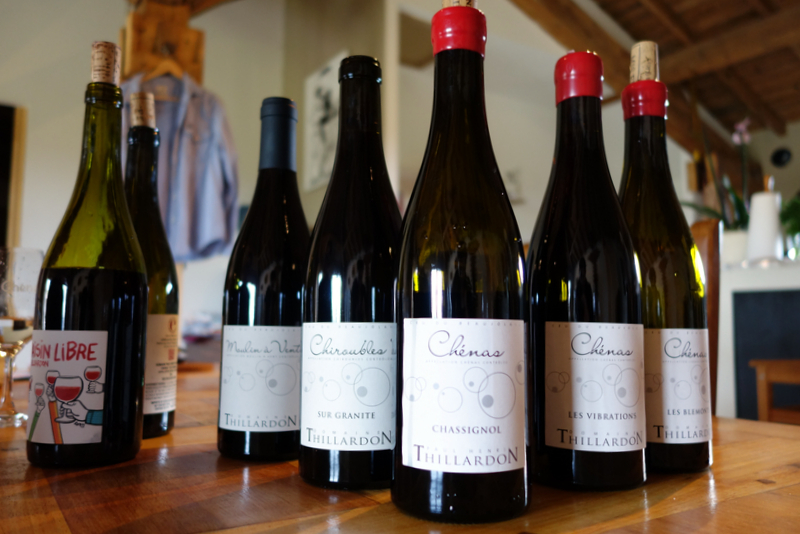 The Chénas appellation, on the contrary, does not need 5 strikingly different cuvées from the Thillardon's, for the average consumer - even the informed natural wine consumer - has little to no idea what Chénas tastes like overall. The appellation has historically been overshadowed by the since-lapsed fame of Moulin-à-Vent, with the result that many of the best parcels have over the years been incorporated into the latter appellation. Presenting so many different faces of Chénas to the market undermines the effort to define an identity for natural Chénas as a whole, by encouraging tasters to focus on the individual parcels. 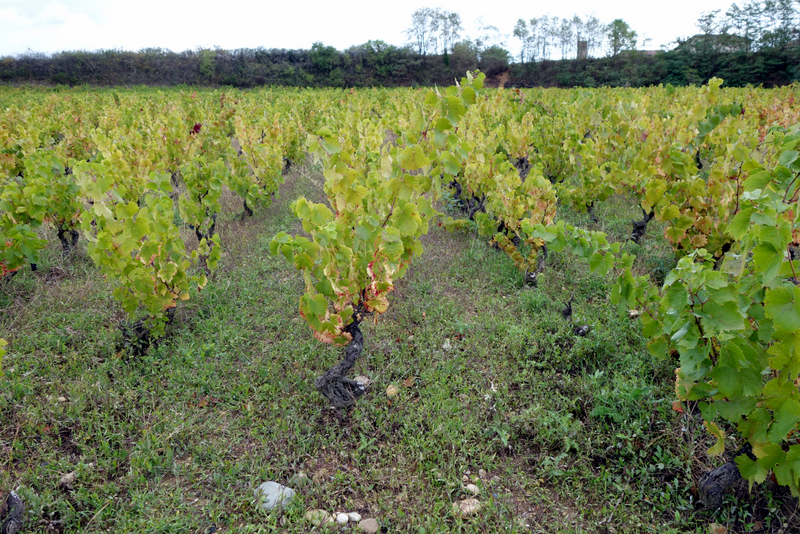 Young vines in "Les Carrières," used for the Thillardons' primeur and for a declassified cuvée called "Raisins Libres, sold almost exclusively in Lyon. In Morgon, Jean Foillard is trending in this direction as well, having débuted, in 2013, a new cuvée from the climat of "Les Charmes." But the market is already well-educated as to what defines a Morgon overall - largely thanks to the work of Foillard and his generation. It's high time to focus on the climats of Morgon. Chénas, not yet. The sky over Chénas in late September. I gently ribbed Paul-Henri about this, suggesting that he might be better off following the example of his friend Yvon Métras, who from diverse parcels of Fleurie makes just one classic cuvée, and a small amount of a lesser "Le Printemps" cuvée for earlier release, and an even smaller amount of "Ultime" in exceptional years. This strikes me as a judicious balance between terroir and commercial identity. When we talk Métras, we talk about the classic Fleurie. When we talk Thillardon, we talk Chénas, but which Chénas? Given the state of the range right now, the Thillardons might as well keep the "Vibrations" tag for their selection-level cuvée, and blend everything else into a basic Thillardon Chénas, with the less-promising barrels seeing release as a springtime bottling. At the end of the day, this is a fairly mandarin debate about commercial identity. I wouldn't be dwelling on it if it weren't for the immense promise already shown by the Thillardon wines. 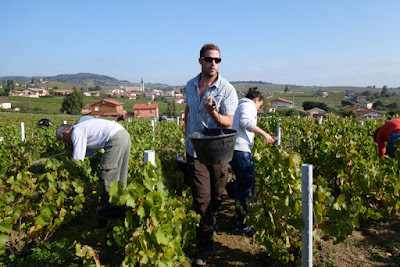 Paul-Henri also displays an instinctive understanding of the role of the vigneron in a community of vignerons. "It’s not enough just to work naturally," he recognizes. "You have to understand the people who make it, drink with them, taste with them." In the course of my four months of visits in Beaujolais, Paul-Henri's was the name most often cited by his fellow winemakers as an example of a neighbor whose work they liked and supported. 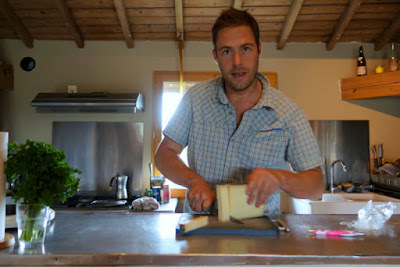 I found him to be equally popular with more conventional winemakers as he was with the natural winemakers. This tells me that the identity of natural Chénas is in good hands, no matter how many micro-cuvées the Thillardons make. An enthusiastic July 2015 piece Domaine Thillardon at Le Point. A laudably in-depth but not quite current piece on the Thillardons at the bizarrely themed retail site Beaujoloire. A concise 2013 blurb on Paul-Henri Thillardon at iDealWine. A thorough run-down of where Paul-Henri Thillardon was in 2012 at Vin-Terre-Net. Good article. 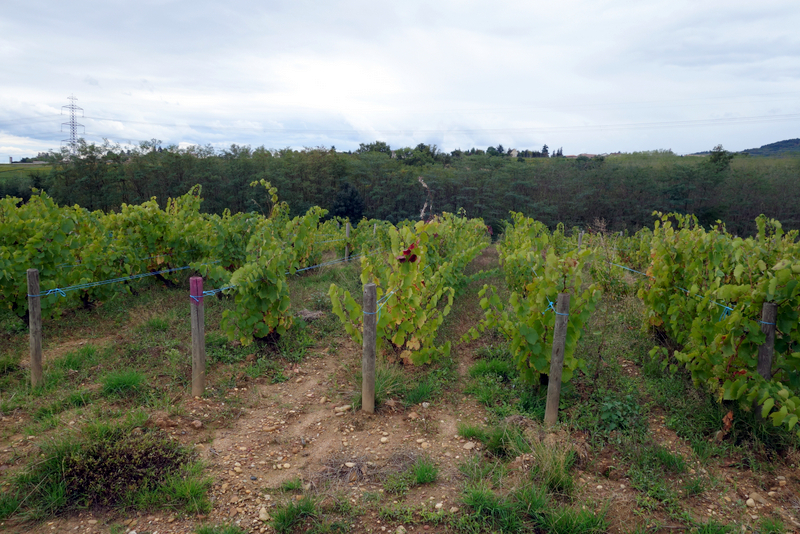 I like the concept of finding or resurrecting vineyard parcels in France or anywhere wine production is famous.